Looking for a great quality globe? 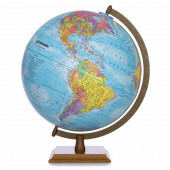 We are the UK's largest online globe specialist since 2005, trusted by over 30,000 happy customers, and we want to help you find the perfect globe. 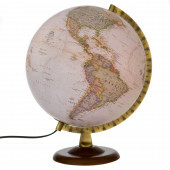 We stock hundreds of world globes from our favourite globe-makers from across America, Italy, Germany, and the UK. These include the globe makers Replogle, Zoffoli, Atmosphere, Columbus Globes, and National Geographic. Our children's globes are perfect for all ages and learning levels. We have globes illustrated with animals in their natural habitats for the youngest explorers, or globes with even greater detail for the more advanced adventurers. Some also have illuminated globe balls which let children continue learning into the night or provide a beautiful bedside lamp. Our selection of Globe Bars are beautifully made in Italy by Zoffoli, the world's oldest bar globe maker. Some of Zoffoli's maps are from different centuries, including a 17th-century map designed by the French cartographer Pierre Duval for the French king Louis XIV. 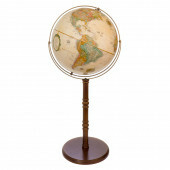 These vintage maps give an insight into the world during that period and make for a fascinating designed classic globe drinks cabinet to display in your home. Help from our friendly staff is only a phone call away, Monday to Friday during office hours. Call (+44) 01536 264 611 to speak to them today. We ship to over 70 countries including throughout the EU, America, and Asia. To see our full list of shipping rates, select your country in checkout or view our delivery rates page for more information.